Abstract : We show that any outerplanar graph admits a planar straight-line drawing such that the length ratio of the longest to the shortest edges is strictly less than 2. 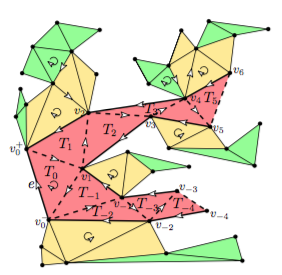 This result is tight in the sense that for any ε > 0 there are outerplanar graphs that cannot be drawn with an edge-length ratio smaller than 2 −ε. We also show that this ratio cannot be bounded if the embeddings of the outerplanar graphs are given.